SABLED FABLES 1972 A glamorous movie star (Alexis as Rita Hayworth) is kidnapped by an Arabian sheik. To keep him from chopping off her head, she tells him the true dish behind the current headlines. It is the story of the competing Bovier sisters, Little Lee-lee and Jackie O. 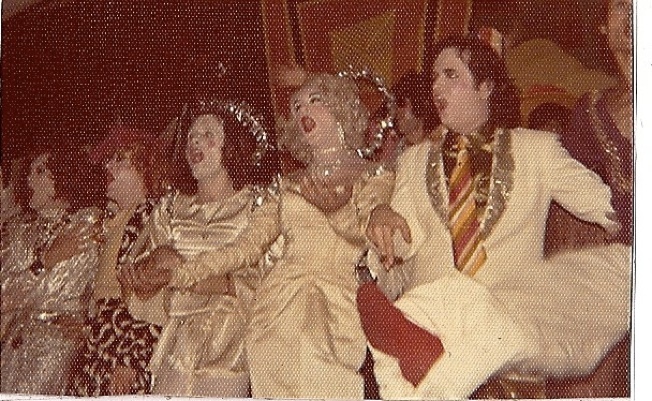 The show, presented at Sammy’s Bowery Follies, had star problems. One star dropped out, the other couldn’t learn lines! Pictured: Alexis Del Lago, ?, Ian McKay, Mario Montez, James Morfogan, Lance Norebo.